by Rob - April 15th, 2017. Filed under: Anniversaries, FlashForward, Triggers. FlashForward — the TV series based on my novel of the same name — went off the air, and so I’d set out to create a novel that would appeal to fans of that TV series. Working on the FlashForward TV adaptation — I consulted on every episode and wrote the nineteenth episode, “Course Correction” — was one of the best experiences of my life. But whenever I think about it, the memory is bittersweet, because instead of still being on the air — we’d be finishing our third year right about now — we were cancelled by the originating American broadcaster after twenty-two episodes. That a science-fiction show got the plug pulled on it too soon is hardly a new story: there was an implicit promise in the opening credits of the original Star Trek that the series would run at least five years but it only survived for three. More often than not, it seems, ambitious science-fiction TV shows get cancelled prematurely. By the time FlashForward‘s sixth episode first aired, I was predicting we wouldn’t be renewed for a second series. The ratings were dropping steadily week by week, not, I hasten to add, because of any deficiency in the program, but rather because, in the United States, we were stupidly scheduled at 8:00 p.m. on the east and west coasts and 7:00 p.m. in the interior; the show was simply too adult, too violent, and too raunchy, for what was perceived of as family-viewing time. From that point on, I was urging that we film two different endings to the last episode of the first series: one that would have opened the show up for a second series, and one that would have provided real closure — the sort of resounding conclusion my original novel had. FlashForward had numerous behind-the-scenes staff changes, and by the time we were nearing the end of our first series, the powers-that-be had other ideas. They were convinced we were coming back, and wouldn’t countenance the notion of a wrap-up at this point. 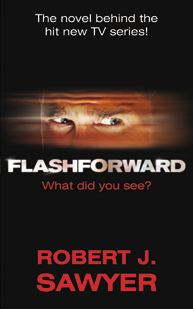 It’s too bad: I think FlashForward could have become a cult hit like The Prisoner on DVD or via download if there’d been some sense of closure at the end. 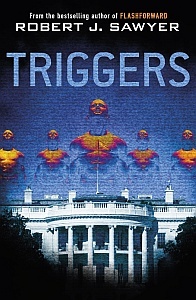 Ironically, I’ve just returned from three days of meetings in Hollywood, discussing the possibility of adapting my new novel Triggers into a TV series. The novel Triggers has a definitive — and I like to think, mind-blowing — ending. The creative exercise in adapting a tightly structured standalone book into what could be an on-going series that might postpone its ending for five years has been fascinating. But, from the outset, this time I am planning for a real ending for the TV version, and hope I’ll have sufficient say to get it actually done that way. I often think of the TV shows I loved that never got the run they deserve. Planet of the Apes. Kolchak: The Night Stalker. UFO. And, of course, more recent shows, such as Firefly and Charlie Jade, a show seen on Syfy in the US that I wrote the series bible for, had much shorter runs than their creators had hoped for. All left with a whimper, not a bang. Still, even when SF TV shows do get to film an ending, it’s often a disappointment. I loved the new Battlestar Galactica but the final hour was a disaster. And Lost — whose writing office was next door to ours for FlashForward on the Disney Studio lot in Los Angeles — ended in an underwhelming way. Even The Prisoner, which I mentioned above, left many people scratching their heads with its conclusion. Which, I think, is ultimately why I like writing books. The author is in full control; no one ever publishes just the first six chapters of a planned twenty-two chapter novel: you get to tell the whole story you intended to tell, and in a standalone novel, the audience can trust that between the two covers they’ll find a beginning, a middle, and a satisfying end — which is precisely what I’ve set out to provide in Triggers. And if the TV version ever does come to pass, hopefully we’ll get to provide the same thing there, too.